Acai bowls have become popular in Brazil, California, and Hawaii, and the trend is slowly spreading to other parts of the world. An acai bowl is a nutrient-packed breakfast and completely customizable. You can swap out ingredients for whatever you have on hand, and this is a great way to use excess garden produce, pick-your-own fruit, or farmers’ market deals. Acai is an incredible source of antioxidants, vitamins and minerals, omega-3 fatty acids, and amino acids. Topped with wholesome, healthful, energizing ingredients, the acai bowl may soon be your new go-to breakfast! The base is basically a smoothie, and you can add more milk for a thinner consistency, and less for a thick, ice-cream-like bowl. Mix all ingredients well in your blender. If you are using less milk to go for the “ice cream” consistency, I recommended using a food processor instead, unless you have a high-powered blender. 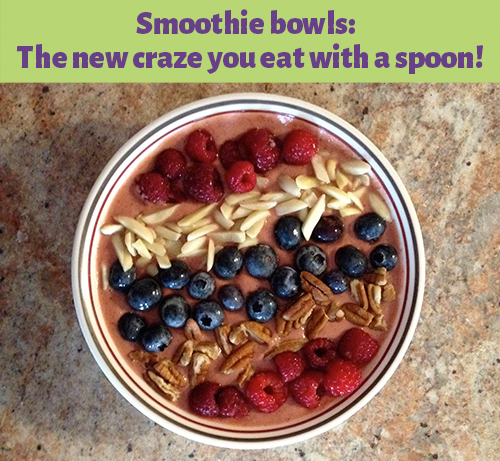 Pour the smoothie into your bowl, and top with toppings. Anything goes! Fresh or dried fruit, chopped nuts, seeds, granola, dry cereal, oats, pretzel pieces, shredded coconut, a drizzle of honey or nut butter, a sprinkle of cocoa powder, or a dollop of Greek yogurt. Mix and match toppings ‘til your heart’s content, and feel free to get a little artsy with your design!